Hope you have a wonderful weekend and also getting more and more excited about for this coming holiday. I’ve done doing my shopping list, wrapping and labelling gifts, etc. It was tedious work, LOL but it’s okay because I love to do it! So today I’m sharing you another awesome courier app that I’ve used weeks ago, and I feel that you should try it too! So sometime last month, it was a good sunny day and I was busy working on my next presentation slides, when my associates emailed me at 10:30am and asking favour to print extra numbers of presentation booklets which he needed the same day at 12:30noon. Everything is ready for printing and materials are available, but what made me worry is how he could get it on time. His presentation is in Ayala Towers in Makati and going back to the office at NET LIMA is such a huge inconvenience, adding to the fact that my minions of messengers are out in the field. For those who know the flow of traffic in Makati and Bonifacio Global City – it is really crazy. Travel time going and back from his destination will take him 2 hours, and its rush hour of noontime! There is no way he can make it on time. Somehow I felt responsible too, (damn) we should’ve prepared extra last night. Anyway, I was thinking of alternative solution that is way practical. I’ve been using GRAB app for two years and I’m telling you, each of my ride is always stress-free. I’ve never encourage to use other car-pooling app since I’ve found GRAB to be exactly fulfilling my needs. Or should I say my other reason - I love patronizing Asian brands that satisfies me. 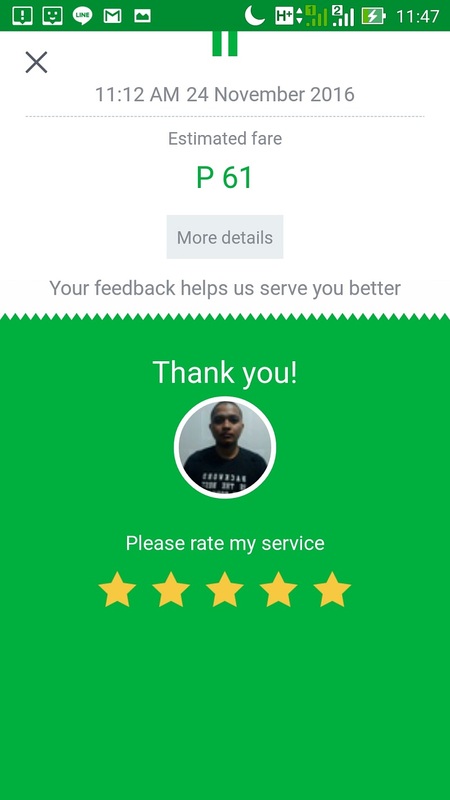 The GRAB app is very user-friendly, perfectly fit my needs, the drivers I’ve encountered are so polite and nice, and haven’t got any bad experience from them. Well, except for some occasional drivers who intentionally cancels my bookings because (1) maybe they didn’t realized the heavy traffic flow, or (2) they just didn’t know the way. But that reasons never discourage me, business I know how the business works. It’s already 11:00am done with printing and binding, and was browsing my GRAB app, when I remember about this GRABExpress. 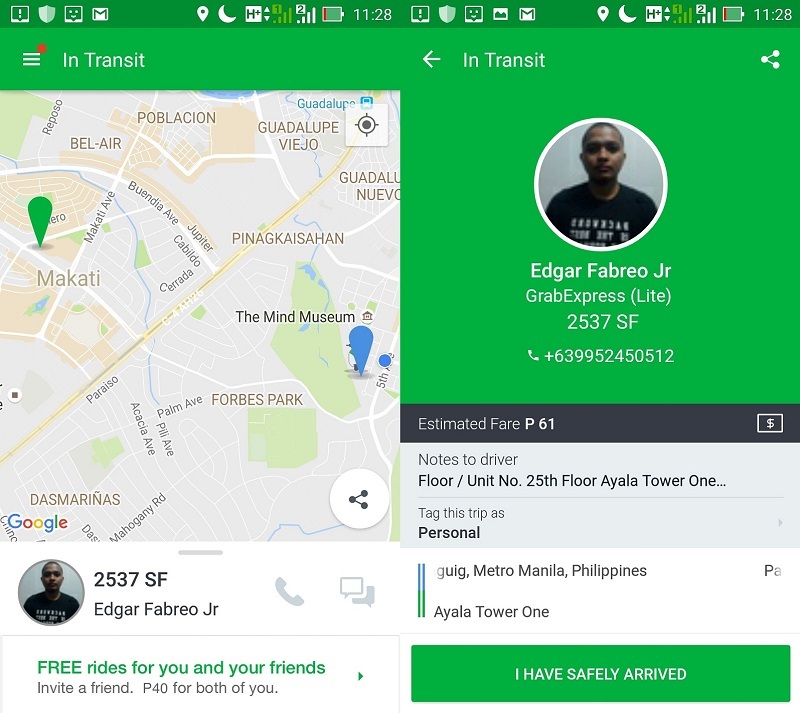 GRABExpress is another services of GRAB where it works like a courier services. Currently still in beta period, for now they cater courier service within Metro Manila. Last year in October 2015 - GRAB kicks-off the GRABExpress, but recently they made the app more user-friendly. Since it’s still in beta period, honestly I have a little doubts with it. But for that time I have no choice but to gamble. I decided to try GRABExpress, booked a service at 11:12am from NET LIMA to Ayala Tower Makati, and hope for the best. I’ve told myself, if this thing fucked up – then I’m the one to blame, hahaha. Luckily, I’ve got a GRABExpress delivery man so fast. GRABExpress may act like your favourite courier service, but works a bit different. Drivers are working just with their motorbikes, and will deliver your packages to someone, but doing this just a drop-off. It’s not your typical door-to-door delivery. 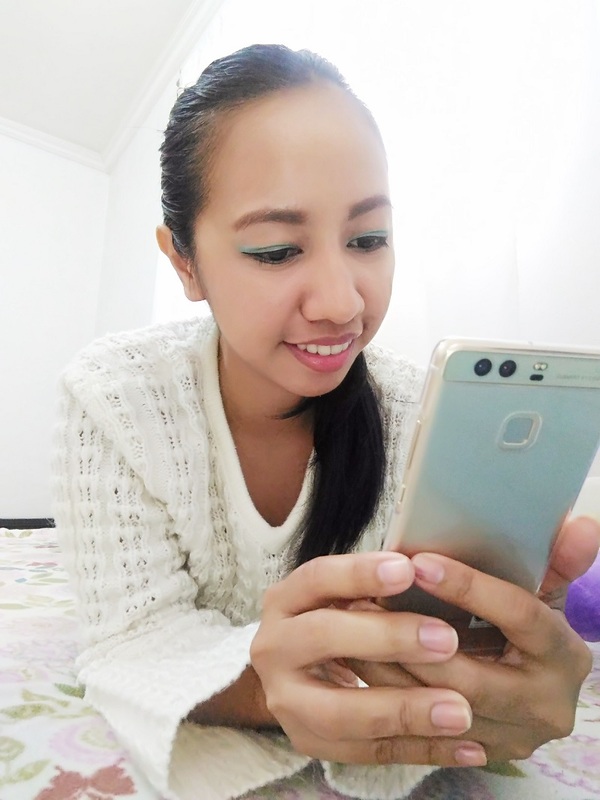 In order to make the delivery faster and accurate, I gave a specific instruction to the driver which you can input in the customized messages box when you booked the service. I also gave him the name of the recipient, and his mobile number. Which I also did to my associate, so he could contact the driver when he’s near the location. At 11:25am GRABExpress driver Kuya Edgar picked up my package from NET LIMA. I’ve also monitoring the delivery through my phone, and honestly I feel like I was a kid watching a game online! At 11:38am arrived at Makati Avenue (Picture 1), then at 11:39am he arrived at Ayala Avenue (Picture 2). Then at 11:41am (Picture 3) GRABExpress Kuya Edgar arrived to the destination and successfully delivered the package. 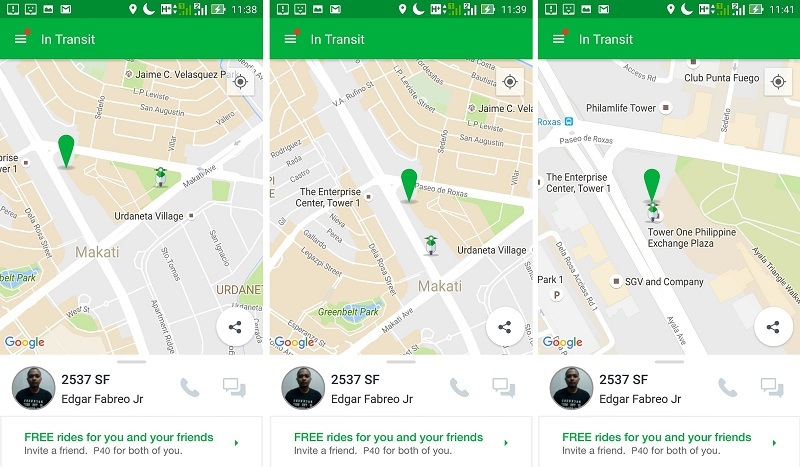 How much is Grab Express? I was only charged Php61.00 (approx. $1.50) for the delivery of my package way more faster and cheaper AF. I’ve felt that relief when the package was successfully delivered on time, and I felt happy that GRABExpress save my day. If my associate insisted on picking up the package, he will not make it on time. Due to crazy traffic at noontime plus the taxi fare which I’ve estimated to be like Php300.00 back and forth (or could be more due to high traffic surcharge) – he will not make it. But seriously, GRABExpress service is a genius. I could track my delivery on real-time. And it’s much cheaper than most of the courier services. Though this service have limitations, I still find it very convenient. For emergency deliveries and just within Metro Manila, you can rely on GRABExpress. You just have to be very specific with the delivery, and also make use that your package is well sealed to make the delivery hassle-free to the driver. In using this service, it’s helping hand-in-hand kind of service. Make sure your package is safe and sealed, because take not that drivers are using motorcycles and typically they only have small carrier containers. I felt so excited after using GRABExpress, and I literally added it to my list of minions, lol. 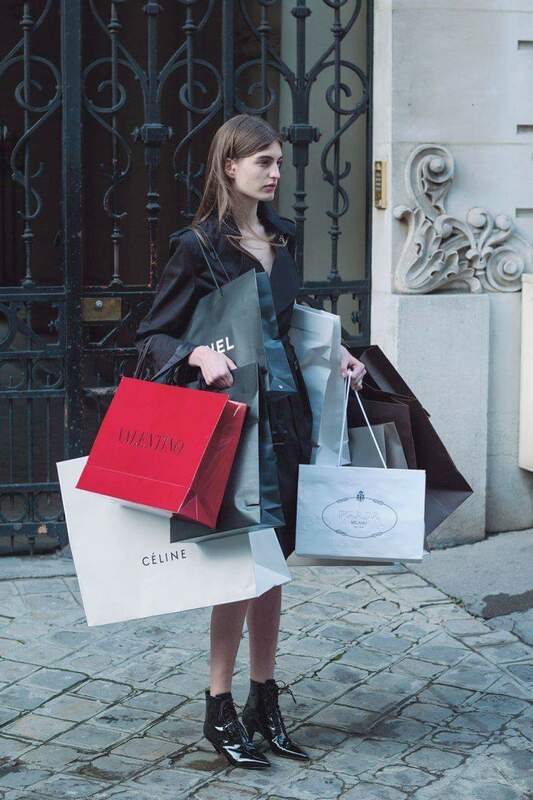 Then I realized, as a shopaholic like me – you may also benefited in using GRABExpress. 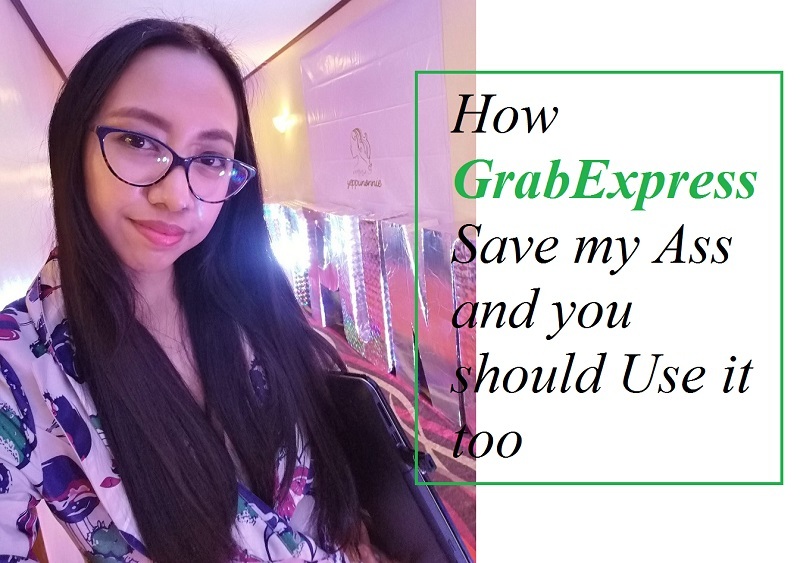 Like if you ordered something from your favourite online sellers in Metro Manila, and you can’t wait to have those purchases – you may opt to choose GrabExpress delivery. Delivery charges may vary depends on the distance and location, but then it is faster than our usual courier services. Online sellers in the Metro should use GrabExpress! This will help you guys to pump up your services, and making your customers more happy shopping at your online stores in the Metro. I strongly recommend you to try GRABExpress, and be amazed with their fast service. Oh okay, I strongly recommend any Asian brand that I’m happily using and gives me efficient result according to my taste and needs. But if you very overly particular with the delivery, and doesn’t might paying extra for the overnight storage, insurance and extra pay for the boxes, especially for those breakable items – GRABExpress is not for you. 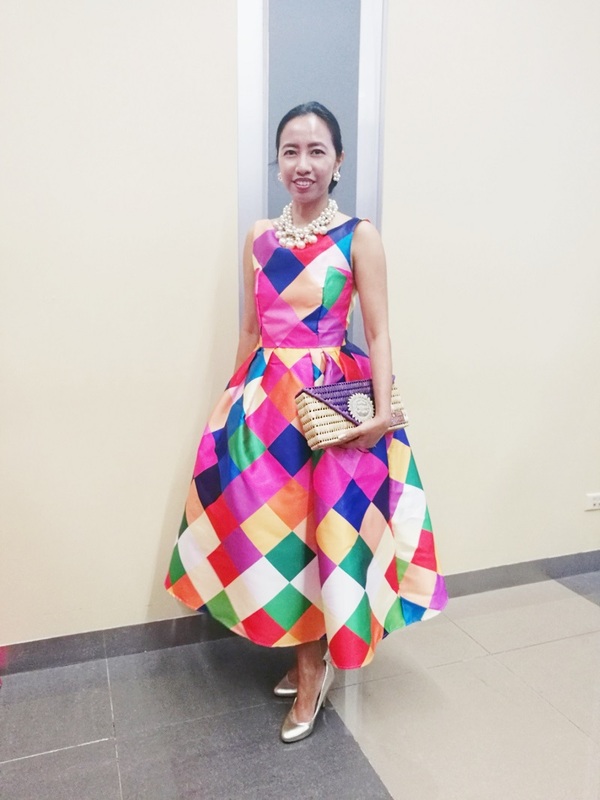 So before I ended my GRABExpress review, I would like to share you my outfit when I attend a party last Friday night. I felt soo lady-like last weekend with this dress! I just got this dress from Landmark Department store which I’ve noticed no one dares to grab it, and I’m in a festive mood this holiday season so this dress seems perfect for me. This is a ready-to-wear dress and surprisingly I fit to its only size! I also fell in-love with its colour and thick fabric, simple cut dress that makes the whole looked like I’m a modern Grace Kelly. Very festive colors and artsy, as my colleagues said. Hhhmm I think I will wear this again for the art festival next year! 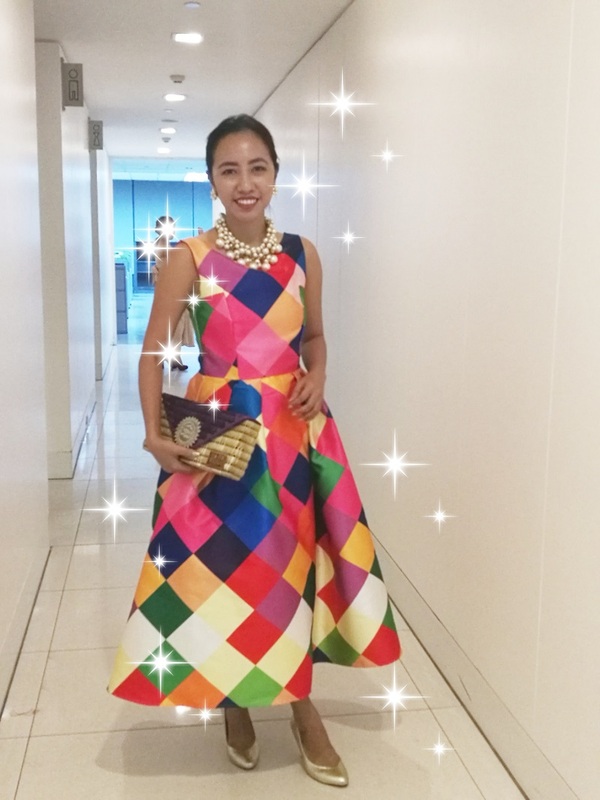 I’ve paired it with my favourite pearl accessories, a gold pumps, and a woven clutched purse that I’ve bought at Vivo Designs (a Filipino brand based in Negros) during the Filipinaz Fair. 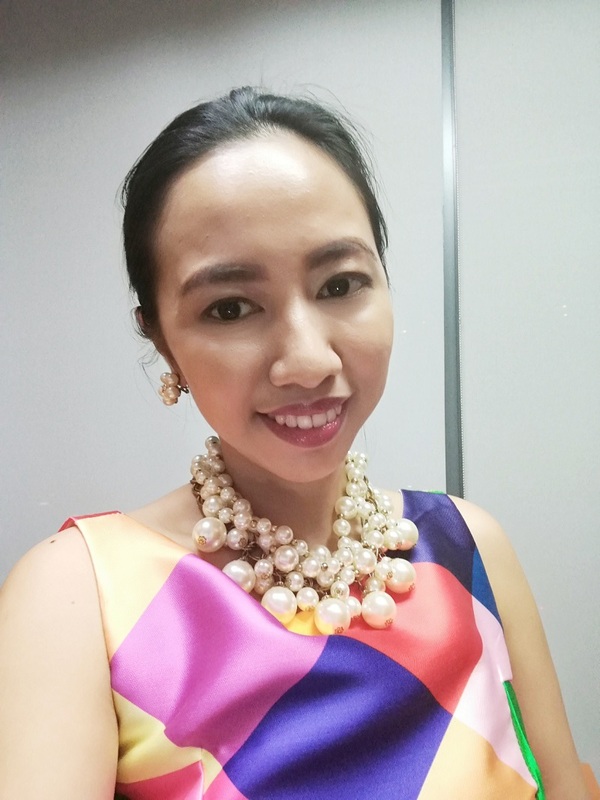 Overall, I realized my whole outfit looks like so modern Grace Kelly, with Filipino touch. What do you think of GrabExpress and also my festive outfit? Have you tried using the GrabExpress? I haven't heard about Grabexpress before but it seems like the great app. I was using Grabtaxi while I was traveling around Asia. It was working perfectly for me! GrabExpress is another product of GrabTaxi, now rebranded as GRAB. It's so cool and very fast service! How cool! Grabexpress sounds like it would be a fantastic app to have. Also, your dress is gorgeous! I love the colors. I've never heard of this app before so thank you for introducing it to me!! It seems like it really helped you get out of bind so that is AWESOME! That dress is amazing! So jealous! I kind of want it for my New Year's party! I haven't heard of GrabExpress, but I will certainly look into it. You look fabulous in that dress! Wow! Thank you so much Beth! I've got this for only $16! OMG, I am going to have to see if they have Grabexpress here in the states. It sounds like it is an amazing app. I am always looking for ways to make my life easier, hahaha! I agree. yup hope it will soon be available in US! I'm all for speed and simplicity! Thank you for the handy and practical reccomendation! Yes, and ideal for more practical and non breakable items. I've never heard of this app before but Grabexpress sounds great. Thank you Amrita! Yeah GrabExpress is amazing and its cheaply effective. Grabexpress sounds like a nice app though have never heard of this before! Love your dress! It looks so festive and colorful. You look gorgeous! Gorgeous outfit! I'm happy you were able to make it to your party without the hassle of trying to send off packages. Ooo this is the first time I have heard of Grabexpress but it definitely sounds like one awesome service!!! Hope the GRAB would be also available to your area. Does UBER have this kind of courier services? We have UBER here. They keep asking me to do a review. How is UBER services in your area? My colleagues sometimes find it not good, sometimes just okay because they said it is more cheaper... but many says UBER drivers are rude. Then I told them, I would rather pay a bit higher for drivers who are delivering the service accurate and in polite way, than to pay cheap.